• How long are corporate name reservations good for in NY, DE, and NJ? • How do you change a corporation's address with the NY Secretary of State? • What information do you need to form a for-profit business corporation in NY? • What does a Registered Agent do? • Why does NY NOT require a Registered Agent? 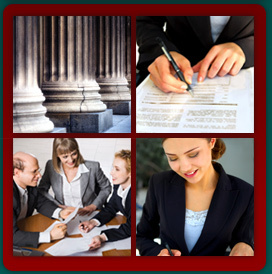 • Why do you need to serve process on a corporation through the NYS Secretary of state? • Does NYS require original signatures? • How long are UCC filings in effect? • How far back can you get information from the NYS DMV? Q: How long are corporate name reservations good for in New York? In Delaware? In New Jersey? A: In New York, 60 days; in Delaware, 30 days; New Jersey, 120 days. Q: How do you change a corporation's address with the New York Secretary of State? A: The address of a corporation can be changed by filing either a Certificate of Change with the Department of State or waiting until the corporation receives the Biennial Statement form. Q: What information do you need to form a for-profit business corporation in New York? A: In New York, you need to have the corporate name, the county the principal office will be located in, the stock structure (you may capitalize up to $20,000 or have up to 200 shares of no par value stock which is taxed at $.05 per share to stay within the minimum tax of $10.00), and an address for service of process. If we prepare the certificate for you, we will need the name of a director so that we may resign as incorporator. In New York, we use an "all purpose" clause and/or can be more specific. In New York, naming a Registered Agent is optional. Q: What does a registered agent do? A: In most states, you must have a Registered Agent and address located within that state for purposes of receiving process. In most cases, the Registered Agent can be an individual affiliated with the entity being formed -- or it can be an authorized service company. The Registered Agent acts as your representative in the state and receives service of process and/or tax-related documents that the State forwards to the corporation. Q: Why does New York NOT require a Registered Agent? A: In New York, an entity must designate the Secretary of State as agent upon whom process can be served and you must provide the State with an address to which the Secretary of State can forward such process. This address can be in New York State or outside of New York State. You may have a Registered Agent in New York, but it is not mandatory. Some corporations domiciled in other states that apply for authority to do business in New York, will put the name and address of their Registered Agent in its Application for Authority. Q: What do you need to serve process on a corporation through the New York State Secretary of state? A: The Secretary of State requires TWO copies of the papers per corporate defendant for service pursuant to Section 306 of the Business Corporation Law. If the corporation is not authorized, you may serve the corporation pursuant to Section 307 of the BCL. In this instance, you would serve one copy on the State. You would then be required to follow up with the registered mail requirements as set forth in the statute. The statutory fee to the Department of State is $40 in either case. When serving a person pursuant to 253 or 254 of the Vehicle and Traffic Law, the State would require ONE copy of the papers and the statutory fee to the Department of State is $10. Again, see the statute for follow up requirements. Q: Does New York State require original signatures? A: No. New York will accept a facsimile or conformed signature on most documents. Q: How long are UCC filings in effect? A: Five years, unless a UCC-3 termination statement is filed. After five years, if the financing statement is not continued, it will lapse. Q: How far back can you get information from the New York State Department of Motor Vehicles? A: After four years, the records are purged and not available. If the incident is alcohol-related, then a record is kept for ten years.